Computer and Machine Vision, Fourth Edition: Theory, Algorithms, Practicalities /by E. R. Davies. 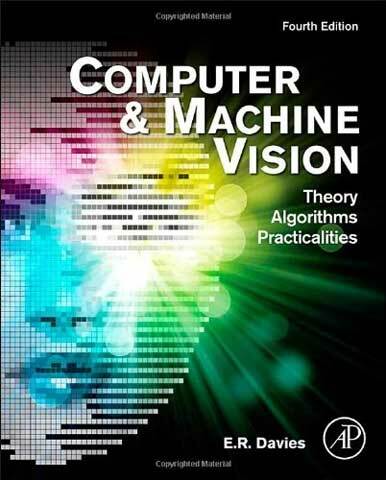 Computer and Machine Vision: Theory, Algorithms, Practicalities (previously entitled Machine Vision) clearly and systematically presents the basic methodology of computer and machine vision, covering the essential elements of the theory while emphasizing algorithmic and practical design constraints. This fully revised fourth edition has brought in more of the concepts and applications of computer vision, making it a very comprehensive and up-to-date tutorial text suitable for graduate students, researchers and R&D engineers working in this vibrant subject. Practical examples and case studies give the 'ins and outs' of developing real-world vision systems, giving engineers the realities of implementing the principles in practice. New chapters containing case studies on surveillance and driver assistance systems give practical methods on these cutting-edge applications in computer vision. Updated content and new sections cover topics such as human iris location, image stitching, line detection using RANSAC, performance measures, and hyperspectral imaging. The 'recent developments' section now included in each chapter will be useful in bringing students and practitioners up to date with the subject. Roy Davies is Emeritus Professor of Machine Vision at Royal Holloway, University of London. He has worked on many aspects of vision, from feature detection to robust, real-time implementations of practical vision tasks. His interests include automated visual inspection, surveillance, vehicle guidance and crime detection. He has published more than 200 papers, and three books - Machine Vision: Theory, Algorithms, Practicalities (1990), Electronics, Noise and Signal Recovery (1993), and Image Processing for the Food Industry (2000); the first of these has been widely used internationally for more than 20 years, and is now out in this much enhanced fourth edition. Roy holds a DSc at the University of London, and has been awarded Distinguished Fellow of the British Machine Vision Association, and Fellow of the International Association of Pattern Recognition. Mathematics and essential theory are made approachable by careful explanations and well-illustrated examples.